Overview: Accurate Audio Consultants has more than 40 years of experience in the industry in broadcast, sound system design, and room acoustics. It strives to provide independent expert consultations to houses of worship, business and industry, education, and the performance arts. Overview: The direct descendent of acoustics and audiovisual pioneers Bolt Beranek and Newman (BBN), and thereby one of the oldest and largest organizations of its type, Acentech is a multidisciplinary acoustics, audiovisual, and vibration consulting firm. Acentech serves as a resource to institutions, engineers, architects, planners, and designers worldwide. Acentech's multidisciplinary team brings extensive experience to critical areas of design, including architectural acoustics, mechanical systems noise and vibration control, environmental noise, audiovisual and multimedia systems, and wired and wireless voice and data networking. Overview: Utilizing an integrated design mindset, Acoustic Distinctions’ team of 20 experts collaborates with various design disciplines to foster a strong collective understanding of how design choices affect project outcomes and support the end-user experience. The firm provides acoustics and AV systems design for spaces serving performing arts, broadcast, corporate, education, museum, government, mixed-use, and worship projects. Overview: Acoustonica is a consulting firm provides services in AV, IT, low voltage, theatrical lighting and rigging, and acoustics, noise, and security design services. The firm works on education, hospitality, worship spaces, sports and entertainment, corporate, and healthcare facilities. Akustiks handled the acoustics and sound design for the restoration of the historic Kings Theatre in Brooklyn, NY. Overview: ArcTech Strategies is a technical consulting resource for the architecture-engineering-construction and facility management fields. Its aim is to assist with the areas that are beyond the normal scope of MEP (mechanical/electrical/plumbing), helping to guide and coordinate technology decisions at the design and construction phases, as well as looking at long-term tech management for client systems. 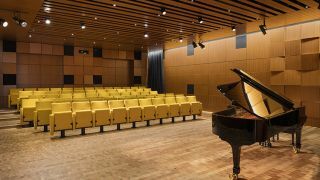 Arup oversaw the acoustic, audiovisual, IT communications, and security design services for the New York City’s Steinway Hall, a retail space, with a recital hall (pictured) and production studio. Overview: Audio Envelope specializes in videoconference and corporate/institutional AV presentation system design. The company produces very detailed construction documents and conduct very rigorous contraction administration, testing, and commissioning. It also performs triage on poorly performing systems and has a successful record of turning unhappy end users into satisfied clients with its experience and troubleshooting skills. Overview: For more than 13 years, AVCS has been providing high-level design, engineering, and doc-umentation services to architects, AV integrators, consultants, IT integrators, and building owners. It has expertise in the following markets: corporate boardrooms, hospitality, higher and lower education, command and control centers, religious, distance learning, judicial, and others. Overview: Auerbach Pollock Friedlander specializes in the planning and design of performing arts and media facilities. Founded by S. Leonard Auerbach in 1972, the firm has developed from a regional entity to an internationally recognized firm with an extensive portfolio of award-winning projects including civic auditoriums, opera houses, professional repertory theaters, concert halls, performing arts training facilities, corporate venues, museums, planetariums, and popular entertainment venues in theme parks, casinos, cruise ships, and night clubs. During the design process of the systems at the Bon Secours Wellness Arena in Greenville, SC, Avant Acoustics utilized Bose Modeler software to precisely define the room’s acoustics, determining that 16 RoomMatch modules would be needed for optimal sound quality. Overview: Established in 1964, Avant Acoustics has cultivated a reputation in acoustics and audiovisual communication systems. With a highly skilled, innovative team of creative professionals, it is able to quickly assess the needs of a project and recommend efficient solutions for acoustics and audiovisual technology. Avant has tackled projects from large-scale airport facilities, convention centers, and arenas, to local academic, medical, and corporate initiatives. Overview: Cavanaugh Tocci Associates provides consulting services in audiovisual systems design, theater planning and systems design, and acoustics for a wide variety of building types and clients. Several recent projects have included large-format, interactive video elements. Specialties include briefing centers, performing arts facilities, higher education classrooms, corporate presentation spaces, athletic facilities, and houses of worship. Specialties: Cerami is a multi-disciplinary acoustics and technology consulting firm rooted in a 50-year history of being passionately responsible about its people, clients, and projects. With a focus on audiovisual, unified communications, acoustics, IT, and security, Cerami is a learning organization that is focused on being experts in the field, understanding its clients’ needs and goals, as well as staying current on the latest technologies to develop practical, buildable solutions for its clients. Overview: Charles M. Salter Associates consults in acoustics and designs audiovisual, telecommunications, and security systems for buildings. Founded in 1975, it is involved in more than 900 projects per year worldwide. Its team of more than 50 comprises professional engineers, LEED accredited professionals, InfoComm Certified Technology Specialists (CTS), registered communications distribution designers, fellows of the Audio Engineering Society, fellows of the Acoustical Society of America, and a Ph.D., as well as individuals with interdisciplinary and advanced degrees in architecture, music, and linguistics. The firm draws from this diverse expertise to develop solutions for arts/media, civic, commer-cial, education, medical, and residential projects. Overview: CMS provides acoustics, AV construction, design, and fit-out packages, enterprise AV, proof of concept studies, AV space planning and technology roadmapping, systems commissioning and training, system and design evaluations, and project man-agement. The firm works globally in a variety of applications, including corporate, theater, education, museum, houses of worship, and many more venues. Overview: Coherent Design is an independent consultancy providing design, counsel, and project management for audiovisual systems, acoustics, theater systems, and ELV technology infrastructure for clients that require state of the art systems. It offers design support for IT infrastructure, security, surveillance, theatrical/performance lighting, and 3D projection mapping. The firm is privately owned and managed by its partners, who have a strong belief that principal involvement in each project is crucial to successful implementation, and sustainable design is of utmost importance. The partners have a combined experience of more than 38 years, which includes a blend of management, consultation, and operations experience and are the vital link between clients and the firm. Overview: Convergent Technologies Design Group specializes in technology design and master plan-ning solutions in educational, commercial, municipal, artistic, and media institutions. Comprehensive system design services combine multimedia, audiovisual, telecommunications, security systems for effective technology design of single-building and campus projects. With nearly 14 years of experience across more than 400 successful projects in a wide variety of fields, Convergent Technologies Design Group delivers technologically sophisticated systems that are designed for easy operation and customized to fit the unique needs of each client. Convergent Technologies addresses the needs of every situation, including design, architecture, capability, and function. Overview: Current Design In Acoustics specializes in high intelligibility, high dynamic range music and speech systems, with 32 years of experience. Combining the art of science and engineering with practical applications in acoustics and sound system design, the company provides owner advocacy, system performance measurement, system calibration and voicing, speaker device calibration, and optimization with DSP-based solutions. It also provides acoustical planning with emphasis on reverberation, echo management, and diffusion of the natural and reinforced sound fields. With a near four-second reverberation time to correct in the lobby of the headquarters for the San Antonio Food Bank, the design team of Dickensheets Design Associates consulted with local Primacoustic manufacturer rep Native Media to find a solution comprised of a selection of Primacoustic lanterns. Overview: Dickensheets Design offers AV and IT systems design, architectural acoustics consulting and design, and noise and vibration consulting and design. It has completed thousands of projects throughout North America for houses of worship, secondary and higher education, performing arts centers, recording/radio/TV studios, industrial plants, athletic and entertainment venues, hospitals, and restaurants. Overview: With 17 years of experience, The Douris Group has the capability to understand and respond to the ever-changing audio and video needs of corporate America. It provides consulting services for budget-conscious businesses, service, and non-profits, as well as government and educational facilities. Overview: Eleven Tech group provides audiovisual and acoustical consulting services to performing arts, corporate, education, hospitality, house of worship, and industrial and manufacturing market segments. Specializing in audio systems design for presentation and audioconferencing, video presentation and videoconferencing, digital signage, mass notification paging, corporate/performing arts lighting design, audio DSP design services, audio-/videoconferencing systems tuning and optimization. Overview: Engineering Harmonics (EH) provides independent technology consulting services in audiovisual, sound, broadcast, digital signage, and control systems software programming. The company’s experience spans higher education, medical, communication, collaboration, sports, performing arts, and assembly facilities with more than 1,200 projects spanning 10 provinces, 15 states, and 12 countries. Overview: Engineering PLUS is a full-service audiovisual design firm. In conjunction with other critical low-voltage systems, it delivers quality documents, specifications, and drawings that transform ideas into a technological reality. It also specializes in retrofit corporate spaces, turning them into client-convivial, user-friendly, leading-edge spaces to impress clients and make employees’ work environments easier, more efficient, and enjoyable. Overview: Exante360 offers professional design and consulting services in all aspects of low-voltage systems in information communications technology: audiovisual, security, data networking, telephone, fire alarm, nurse call, indoor and outdoor wireless communications, distributed antenna systems, clock systems, overhead paging, mass notification, patient entertainment, digital directory, and much more. Exante360 also provides peer reviews, project management, construction administration, commissioning services, and feasibility studies. Clients include healthcare, academic institutions, government/civic, corporate, and data center environments. Overview: Glumac is a full-service MEPLCTE firm of engineers, consultants, and designers focused on sustainability and innovation. It houses a deep talent pool with services and expertise in mechanical, electrical, plumbing, lighting design, building commissioning, technology, and energy. The technology team is staffed with experts in audiovisual design, security, and communication systems. Overview: GraceNote provides specialized audio, video, and acoustic systems design, consultation, and technical writing services to end users, architects, systems integrators, manufacturers, and industry trade magazines. Owner Mike Fay's passion for architectural acoustics led him to form GraceNote Design Studio, with the goal of bringing his proprietary DAPCO VLF absorption appliances to market. Overview: The Greenbusch Group is a multi-disciplinary firm established to serve the expanding need for technical expertise in acoustical and vibration consulting, mechanical engineering, audio/video tech-nology consulting, vertical transportation design, and commissioning services. Overview: Since 1993 HAVS, Incorporated or (Hammack Audio Video Solutions) has provided audio, video, and control systems solutions. Its focus is on design, engineering, and programming. Fred Hammack is a Crestron Certified Master Programmer, Crestron Digital Media Certified Engineer, Crestron Service Provider, and Extron Certified Control Professional. One of the company’s specialties is in Voting Systems for city council and boardroom applications. The HAVS voting system, which is built around Crestron hardware, is easy to set up, easy to use by city clerks who are busy with other responsibilities, and the results are professionally displayed on projectors or monitors. Locations: Lenexa, KS; several others in the U.S.
Overview: Founded in 1970, Henderson Engineers is a comprehensive engineering design firm offering core mechanical, electrical, and plumbing design, as well as fire protection, architectural lighting, technology, commissioning, and sustainable consulting services. With 10 locations nationwide and more than 500 employees, HEI offers clients large-firm resources coupled with the specialized experience and responsiveness of a small firm. In addition to its core services, HEI offers four specialty divisions that include fire dynamics for licensed fire alarm, sprinkler design, and code consulting; impact illumination, for architectural lighting design; and collective tech for network infrastructure, security planning, AV, acoustics, and communications cabling design. Overview: A global independent consultancy specializing in IT, AV, acoustics, audio systems, digital signage, and display solutions, Hewshott’s services also include specialist project management and high-level strategic planning. The firm seeks to add value by providing the best possible solution, regardless of manufacturer, and ensuring a solution that is shaped by needs, rather than perceived limitations of technology. Its solutions start with very close engagement with its clients, seeking their goals and needs. This results in a solution that is individually designed and customized to meet the precise needs of each client. One of Hewshott’s key strengths is its global reach: The company draws on its skills and experience from around the world on a broad range of projects and a diverse set of clients. Overview: Until recently known as Acoustic Dimensions, Idibri is a firm of technology designers, theater consultants, and acousticians specializing in arts, entertainment, sports, worship, corporate, and education projects. Its interdisciplinary team of specialists handle acoustics, audio, video, data/IT, theater design, lighting, theater equipment, and security. For clients in need of accelerated delivery, the firm offers rapid-prototyping of auditorium designs and acoustics/technology solutions. Overview: Specializing in the educational market space, including K-12, college and university, Integrated Design Solutions is a team of full-service technology consultants designing and integrating audio, video, control, voice, data, and security systems. Planning for long term flexible solutions, the firm provides comprehensive voice, data, audiovisual, and security technology solutions that foster innovation, encourage collaboration, and enhance performance. The Jaffe Holden team specified a pair of Meyer Sound CAL 64 column array loudspeakers for direct reinforcement of speech and occasional music for the Redemptor Hominis Chapel in the Saint John Paul II National Shrine in Washington, DC, as well as a Meyer Sound Constellation system to create an acoustic that is ideal for traditional Catholic worship. Overview: James S. Brawley & Associates is a full-service acoustical and sound system design firm established in 1981. It has provided acoustic and sound system designs for many 1,000- to 4,000-seat auditoriums, theaters, and worship spaces, as well as large athletic and concert venues. It currently has consulting relationships with audio equipment manufactures, architectural and engineering firms, and sys-tems contractors. It specializes in loudspeaker system modeling, DSP configuration, and optimizing tun-ing systems to the venue geometry. Overview: For the past 10 years, K2 has provided audio, video, and acoustics design services to clients both nationally and internationally. In addition to working in traditional markets, K2's expertise in AV networking, digital signal processing, and programming, has led to many opportunities for collaboration with manufacturers, systems integrators, and other AV consultants. This includes the creation of custom user interfaces, and providing custom programming or scripts to enable advanced monitoring and con-trol, and to interface devices with disparate communication protocols. Overview: Kirkegaard Associates provides consulting services in architectural acoustics, mechanical noise and vibration control, sound isolation, and audio/video systems design. With more than 2,700 projects in 24 countries since its establishment in 1976, the firm’s expertise includes performing arts centers, theaters, educational facilities, concert halls, amphitheaters, opera houses, conservatories of music and art, museums, religious buildings, recording and broadcast studios, corporate offices, convention and conferencing centers, and hospitality. Locations: Fort Thomas, KY; Columbus, OH; Dayton, OH; New York, NY; several others in the U.S. Locations: London, England; several others in the U.S.
Overview: Kronman Associates provides a full range of LED and display consultancy services, from content strategy, through to hardware specification, design, and implementation. It works with brands, innovators, designers, architects, engineers, and technologists to bring concepts to life. It primarily works in the U.S. and the U.K., although its team is also available in Asia, Europe, and the Middle East. Overview: Labrador’s IT strategy consulting, technical design services, and technology program management help solve the business, facility, and technology needs of sophisticated, enterprise, and mid-size organizations in the U.S. and around the world. Labrador has deep experience in the sectors of financial services, retail, media, legal, education, and healthcare. Overview: LTS has focused for more than 20 years on video and audio facilities and systems with an emphasis on, but not limited to, professional production users. Specializing in audio, acoustics, technical systems, engineering management, and more, Lab Tech Systems’ overall expertise in many types of technical systems makes it a valuable resource for commercial and residential projects requiring an engineering consultant. Overview: Lipp AV Design is a small sound and AV consulting company specializing in theatrical and performance audio systems, with expansion into commercial AV. Overview: MCH provides uniquely integrated consulting services in all areas of building acoustics and media systems throughout the U.S. and internationally. With more than 2,000 projects, its portfolio includes all building types, including signature projects in performing arts, production, and higher-education facilities, as well as courts, large and small assembly spaces, medical and research facilities, museums, and libraries. MCH design professionals are formally trained in building acoustics and AV as well as in architecture, physics, mechanical engineering, performing arts, electrical engineering, and the liberal arts. Overview: McSquared System Design Group is an independent design consulting firm providing audiovisual systems design services throughout the world since 1996. The company is focused on designing the most effective technical solutions for the users' needs and then successfully integrating that solution into the architectural environment. McSquared also has an extensive background working on large scale post corporate, secondary, medical care and medical education/simulation-type facility projects permitting it to understand the importance of working with the user groups and the project stakeholders to determine and validate the specific functional, performance, and operational requirements. Overview: Metropolitan Acoustics is an acoustical and audiovisual consulting firm providing services in architectural acoustics, noise control, and sound and AV system design. Founded in 1990 by the present owner, Felicia Doggett, Metropolitan Acoustics is a certified Woman Business Enterprise (WBE) in the city of Philadelphia, the commonwealths of Pennsylvania and Virginia, the states of New Jersey and Delaware, and the Port Authority of New York and New Jersey. Typical clients include architectural firms, engineering firms, developers, and builders. The firm also works directly for private companies, as well as educational institutions and places of worship. Overview: For more than 30 years, Michael Garrison Associates has partnered with faith-based organizations across America, providing assembly space consultation, design, project management, and technology installation services for projects with 150- to more than 10,000-seat capacities. Overview: Mulvey & Banani International of Toronto was founded in 1981 through an amalgamation of two longstanding predecessor firms established in 1955 and 1964 respectively. Its scope of services includes electrical engineering, critical power, IT/communications, life safety, electronic security, architectural lighting, audiovisual, and sustainable design. Engineering for the new era of intelligent buildings with converged building systems, Mulvey & Banani’s AV systems design and commissioning division specializes in conference facilities, public address, multimedia, teleconference, stadium systems, sound reinforcement, mass notification systems, lecture theaters, and houses of worship. Overview: Newcomb & Boyd is a multidiscipline consulting and engineering firm providing innovative solutions for facility design, construction, and maintenance. The firm comprises the Consulting Engineering Group, the Commissioning Group, the Special Technologies Group, and the Lighting Design Group. These groups offer clients a single source for mechanical, electrical, plumbing, fire protection, energy management, building automation, commissioning and retro commissioning, systems training, acoustics, audiovisual, communications, theatrical systems, security, and lighting needs. Overview: PEC is a trusted engineering firm with a half-century of design expertise, including more than a decade of experience in designing audiovisual systems. It provides audiovisual consulting services for K-12, higher education, houses of worship, business/conference rooms, municipal boardrooms, and courtrooms. Overview: Professional Systems Engineering (PSE) has provided advanced systems for communications, multimedia, acoustics, noise and vibration control, and related systems design needs since 1986. PSE has extensive experience providing a complete ITAV infrastructure, information technology systems planning, and specialized audio, visual, video and lighting design and engineering services. Specializing in site-wide communications systems in special environments including academic, justice, corrections, performing arts, theaters, museums, and for diverse government and corporate clients nationwide, its services include network information technologies, teleconferencing, multimedia touch and face-front technologies, courtroom technology design, situational awareness environments, architectural sound and projection, and integrated voice/recording and processing systems. Overview: PTS is an IT consulting and project management company that provides professional ser-vices, managed services, and resourcing solutions. Since 1983, PTS has successfully delivered high-value, vendor independent solutions to its clients' needs in more than 80 countries and in some of the most demanding environments. It is not a body-shop, but instead it provides business solutions delivered by a technically proficient and highly motivated team. Overview: Since 1995, Robert Derector Telecommunications (RDT) has been providing its clients with a full range of IT-related design, engineering, and consulting services. These services, which include IT infrastructure and systems engineering, electronic security, and audiovisual system design, are geared toward providing solutions for today’s technology-intensive workplace. Its principals and engineering staff have a broad range of experience that includes financial services firms, corporate offices, academic institutions, research and development facilities, and government buildings. Overview: RTKL provides end-to-end planning, architectural, and creative services. It takes great architecture rooted in smart planning and urban design to the next level with services like interior design, environmental graphic design, and intelligent engineering and applied technology services. Within the technology design studio, RTKL’s audiovisual practice specializes in academic, civic and cultural venues, corporate workplace, government, hospitality, mission critical, and retail and entertainment applications. Overview: Shen Milsom & Wilke is an international firm of more than 230 talented and dedicated individuals who provide consulting and technology design on large and small projects in acoustics, audiovisual multimedia, IT, physical security, and medical equipment planning. Its specialty consulting services include data center planning, network operation center and emergency operation center design, technology-enriched operating room design, medical simulation facility design, and financial trading floor design. Overview: Lynn Fuller, president and senior consultant, formed Sound Designs to provide unbiased as-sistance to the small and medium house of worship market in the design, procurement, and operation of sound reinforcement and acoustics systems. His electrical engineering degree, lifelong interest in sound reinforcement, and specialized training from organizations such as SynAudCon have uniquely positioned him to be a value-added resource to this segment of the market. Overview: Services include engineering, IT architecture, wireless, security, AV, acoustics, and lighting. Markets include healthcare, higher education, commercial, retail, entertainment, and more. Overview: Spectrum Engineers provides client-centered technology, audiovisual, and security design services in addition to electrical, mechanical, acoustical and fire protection engineering and lighting and theater design services in the fields of healthcare, education, houses of worship, government, commercial, hospitality, and data centers. Its technology design specialists provide professional consulting services for nurse call, EdNet, studios, control rooms, sound, video and/or satellite systems, communication systems, voice and data cabling, locking control systems, video surveillance, intercom/paging, AV systems, fire alarm, CCTV, TV distribution, security/access control, and intrusion detection systems. Overview: Stages Consultants provides consulting for every facet of planning, designing, and constructing performing arts venues. Among its services are project visioning, feasibility and existing conditions evaluations, space programming, room acoustics, theater conceptual design collaboration, seating layouts and sightlines, noise and vibration control, sound isolation, stage equipment, and production sound and video systems design. Overview: Audiovisual experts who understand the importance of effective communication, Syska Hennessy Group works to improve collaboration and enhance presentations in conference, meeting and training rooms, and boardrooms and ballrooms. It provides designs for broadband video distribution systems, audio and video distribution systems, program audio amplification, local and remote digital control systems, audio and videoconferencing, data collaboration/distance learning, theater systems, digital signage network display systems, converged AV and IT networks, and PA command and control systems. Overview: Talaske provides acoustic, audio, and video consulting services, specializing in the design of performing arts and assembly facilities, but active in the design of all building types. Its expertise is in room acoustic and noise control design and in the design and specification of audio and video systems for permanent installation within buildings. Overview: Technology Design Resources is a 15-year-old firm, emphasizing educational projects both in AV and IT systems. It has done extensive work in the Mid-Atlantic area for higher education as well as government projects. TDR’s planning, design, and consulting takes into account the institutional vision, pedagogy, future trends, human factors, and all organizational structure requirements. TDR’s consultants educate, design, and guide all of their clients’ expectations and technological growth, preparing them today for challenges that extend far into the future. Overview: Founded in 1991, Technology Visions is a full-service consultancy that offers a broad range of options for each client, enabling a precise match to be made between needs and budgets. It provides room acoustics design and specification, acoustic treatment planing, project management and coordination, system calibration (audio) and testing, design evaluation and recommendations, and many other related services. It also provides services to dealers and professionals for showroom design, configuration, calibration, tuning, and room acoustics control and specification. Overview: Technical Design Group (TDG) is a firm that specializes in acoustics, technical design, con-struction administration, and project closeout of high-quality audio, video, and broadcast cabling systems for the sports stadium, performance theater, convention center, religious, and corporate markets. The firm is directed by Patricia Miller and John Miller, who together have combined experience of more than 30 years and 500 projects. TDG’s philosophy of systems design is to provide the end user and owner the highest-quality technical systems available that meets the budget requirements for each individual project. Overview: Telemanagement Resources International is a 34-year-old management consulting firm specializing in assessment, design, project management, usage/adoption, and training of conferencing and collaborative communications systems including audio, data/web, video, telepresence, and streaming. TRI also provides AV and IT assessment and evaluation. Overview: Consultants specializing in performing arts technology and safety, Teqniqal offers independent assessment, consulting, and coordinated design of complex performance systems. They work to bring systems of equipment together to work harmoniously with the building, production crew, performers, and audience in a safe and reliable manner. Locations: Atlanta, GA; Boston, MA; Columbus, OH; several others in the U.S.
Overview: The Sextant Group is a national, independent, full-service consulting, planning, and design firm specializing in spaces where communication, collaboration, and/or presentation are mission-critical. Clients include education, medical, corporate, government, institutional, performing arts, broadcast, and sports and recreation, with services in design and specification of audiovisual systems, IT/telecom, structured cabling, building security, architectural and environmental acoustics, technical lighting, and medical communications. Overview: Thinkwell is a global design and production agency that creates custom, content-driven experiences for companies and brands in the physical world. Clients include IP and brand owners, developers, museums and exhibits, live shows and events, and theme parks and resorts. Services include opportunity assessment, brand development, concept development, design packages, master planning, project management, technical lighting and audio, show production, media production, in-field art direction, installation supervision, programming and training, and digital experiences and gamification. Overview: SH Acoustics consists of acoustic and audio consultants with diverse backgrounds that include architecture, music, live sound, studio recording, mechanical engineering, electrical engineering, and general construction. SH Acoustics has carved out a successful reputation in specialized markets that include museums and exhibit galleries, high-end residential, themed entertainment, recording and broadcast studios, performance and presentation spaces, and corporate facilities. Overview: The Shalleck Collaborative offers comprehensive consulting services in the planning and design of spaces for the performing arts and production systems. The range of performing arts venues it covers includes those for all forms of music, drama, dance, and multimedia performance for education, professional touring and resident companies, and community theaters. Overview: Thorburn Associates approaches system design from the perspective of sensologists and technologists: acoustical and lighting designs affect the senses and how someone feels within a space; audiovisual, structured cabling, and security designs are technology-oriented and require attention to detail as well as current knowledge of the industry and where it is headed. The company provides a full range of services to allow the client, architect, or end user a single point of contact during design and construction. Its team is approachable and accessible, including principals, who are highly involved with all projects. The team thinks holistically about its projects, recommending cost-effective, functional, and durable solutions. Founded in 1992 by principals who have consulted on and managed more than 2,600 projects, TA is certified as a Women Owned Small Business. Overview: Tomei AV Consulting is owned and operated solely by Mike Tomei, serving as an independent audiovisual consultant. He provides AV system design, installation project management, and AV management consulting services to the higher education, K-12, corporate, and commercial markets. His AV management consulting services help higher ed AV support departments develop their strategy, structure, management and operations by working on their strategic planning, organizational structure, campus-wide technical/design standards, staff training, and project management process. Overview: Thrasher Design Group specializes in houses of worship and large venues, providing audio system design, consulting, along with extensive training services. Overview: Threshold Acoustics provides room acoustics and audio/video design consulting services for performance and education facilities, worship spaces, cultural buildings, and other places of public assembly. Threshold's approach to acoustics consulting emphasizes reinforcing the visual realm with the subtlety, variety, and even surprise that an awareness of the aural realm can bring to the built environment. Overview: Vantage Technology Consulting Group designs telecommunications, information technolo-gy, data networks, audiovisual, security, clinical technologies and low voltage systems. It provides strategic technology consulting, including business continuity/disaster recovery planning, financial analysis, organizational development, technology assessments, and transition planning. It works across the country and internationally with clients in higher education, healthcare, public sector, corporate, and commercial markets. Overview: VanWert Technology Design is a Southern California-based firm specializing in low-voltage systems design, consulting, engineering, and management. It has completed numerous projects throughout the country for affluent business owners, Grammy Award winners, and Academy Award nominees. Founded in 2010, VanWert Technology Design was formed to meet clients’ needs for unbiased design and consulting services regarding low-voltage systems for luxury properties. Overview: Visual Acuity is a technology consultancy leading challenging, high-quality assignments for integrated network, AV, green building, and interactive technology projects. It follows a three-stage business model of consulting, design, and management, working worldwide with current projects in Miami, San Francisco, New York, and London. Overview: Walters-Storyk Design Group (WSDG) is a global architecture, acoustic, electro-acoustics and advanced audiovisual systems integration consulting and design firm. WSDG’s more than 46 years of innovative design achievement has produced over 3,500 diverse global projects. WSDG is a 10-time winner of the international NAMM TEC Award for studio design creativity. The firm’s work has been published extensively, and discussed in numerous professional audio, broadcast and systems design media. Overview: Waveguide Consulting provides independent technology consulting services in audiovisual design, information technology design, acoustics consulting, control system software programming, and onsite technology management. Founded in 1996, Waveguide's work includes projects for Fortune 500 corporations, top universities, and major government entities. Its award-winning team includes many RCDDs, LEED APs, PMPs, and more certified AV design professionals than any other consulting firm, with 16 InfoComm International Certified Technology Specialists in Design (CTS-D) among its staff of 58.